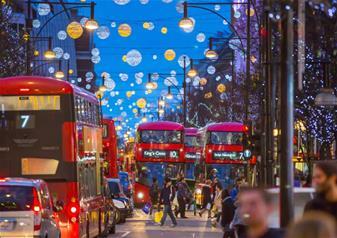 A unique and special experience, tour the city London to see the beautiful Christmas lights on Christmas Day. Soak up the unique atmosphere in the city, when a sense of calm descends upon London and see some of the most iconic structures, specially decorated for the festive season. Choose a tour departing at either 6pm, 7pm or 8pm. Starting from Victoria, with a live English-speaking guide informing and entertaining along the way, go past Buckingham Palace before heading towards Big Ben and the Houses of Parliament. The way these landmarks look at Christmas time is something really special – crossing over Westminster Bridge as you see the Thames sparkling in reflection is something you’ll never forget. Continue on to Trafalgar Square to see the beautiful Christmas Tree – a yearly gift from the people of Oslo – then on to St Paul’s Cathedral and Tower Bridge, both looking stunning especially for Christmas. Passing along the Strand, through Piccadilly Circus and along Regent Street, see the world famous Christmas decorations that delight shoppers and theatre goers alike. The tour finishes by passing Marble Arch and Hyde Park before heading back to Victoria– there are some incredible photo opportunities along the way. This tour will finish in Victoria at approximately 1 hour and 45 minites after your selected departure time. You cannot hop on and hop off on this tour. Please select the time of departure from the Activity Options panel.